In Android's digital world, hackers often steal data that users think is hidden or "deleted" from their Android phone. This is a huge threat to mobile phone users, and the threat is mainly reflected in the leakage of trajectory information caused by location service vulnerabilities. While some security software claims to put an end to this situation, it is often hard to be satisfied with the effectiveness of the software to remove data from android phones. And to factory reset an Android does not completely delete everything from Android phone, neither. So how can you erase everything from Android device such as Samsung, Huawei, LG, HTC, Sony, Motorola, ZTE, OPPO and so on? Why Should I Need to Wipe Out Everything from Android device? As mentioned above, restoring an Android phone to factory settings does not completely erase all data from Android phone, such as the trace information of your Android phone. And these location information can show the Android users's activities, such as the location/time/frequency of user's activity; what's more, it will make a detailed analysis of a person's complete behavior trajectory and obtain the user's private data, making users have no secret. However, most of users are not aware of this danger and lack of strong awareness of completely erasing data from Android phones, which has also contributed to the proliferation of information leaks. To reset an Android phone to factory settings is a common way to delete all contents and data from Android device, and it is very easy to operate directly on your Android phone. However, this does not help you completely erase all files from Android device and there is still chance to recover lost files after factory reset. Anyway, it is also an optional choice to resolve your problem. Step 1. Open the Settings app on the Home screen of your Android device. Step 2. Under Settings page, please tap "Back up and reset" option to move on. Step 3. 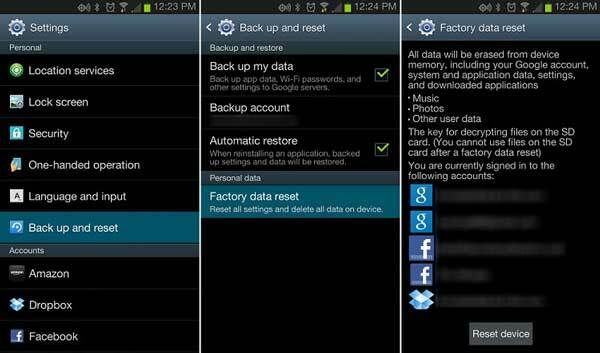 Tap "Factory data reset" option at the bottom, then you will be told that all data will be erased from Android device memory, including the Google account, system and application data, settings and etc. Step 4. Tap "Reset device" option to start resetting your Android phone to factory default settings. When the process is finished, your device will be rebooted and you can start to set up your device now. See Also: How to Backup and Restore Android Phone/Tablet on Computer? To completely and permanently erase all data from Android device, it is strongly recommended to rely on a professional third-party erasing tool like Android Data Eraser (Windows/Mac). 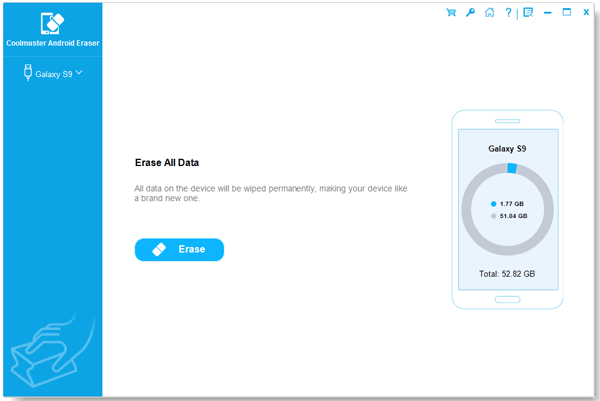 With it, you can easily wipe out all data from Android phone with zero opportunity to be recovered, including the existing data and deleted data on Android phone. After erasing everything from Android phone with this erasing tool, all kind of files will be removed from Android phone permanently, such as photos, videos, contacts, messages, call history, notes, memos, search history, apps, settings, app data, app caches, app temp files, photo caches and etc. And it is fully compatible with all Android phone, including Samsung, Huawei, LG, HTC, Sony, Motorola, ZTE, OPPO and etc. Now, please download the free trails of the program in Windows or Mac version on your computer and start to erase everything from Android phone without hassle. Note: Before erasing all files from Android device, it is advised to backup Android data at first in case of data lost. Step 1. Launch the Android Data Eraser after downloading and installing, and link your Android device to computer with a USB cable. 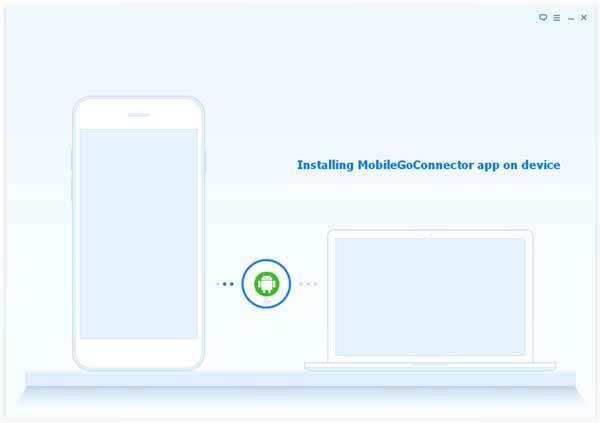 After that, please install the MobileGo connector app on your device for successfully detecting your device. Step 2. When the program detects your device, please hit "Erase All Data" mode on the interface. Then click "Erase Now" button and type "delete" on the pop-up window to confirm your action and start to wipe out all data from your Android phone permanently and safely. So easy, right? Only 2 steps can help you erase Android data and protect your personal information from leakage. Why not have a try of this powerful Android Data Eraser.